Cuban Party and State leaders affirmed their determination to develop the traditional friendship with their Vietnamese counterparts while hosting Politburo member Vo Van Thuong during his visit to Cuba on November 2-6. 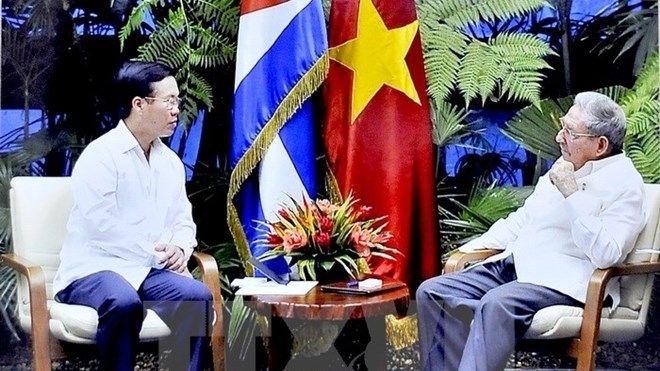 Politburo member Vo Van Thuong, who is also head of the Communist Party of Vietnam (CPV) Central Committee’s Information and Education Commission, met Raul Castro, First Secretary of the Communist Party of Cuba (CPC) Central Committee and President of the Council of Ministers. He later met with Miguel Diaz Canel Bermudez, First Vice President of the State Council and the Council of Ministers and Lazara Mercedes Lopez Acea, Secretary of the Havana Party Committee. The two sides agreed to increase delegation exchanges and experience sharing, improve the operational efficiency of the inter-governmental committee, expand economic partnerships and promote investment cooperation. 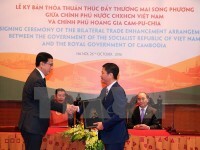 They hoped to conclude negotiations as soon as possible to reach the signing and ratification of the Vietnam-Cuba new trade agreement, creating a legal foundation to increase two-way trade to US$ 500 million in the next five years. Vietnam and Cuba also agreed to prepare for the fourth theoretical workshop between the two parties and activities to celebrate the 45th anniversary of late Cuban leader Fidel Castro’s visit to Quang Tri province. Raul Castro invited CPV General Secretary Nguyen Phu Trong to visit Cuba in 2018. During the visit to Cuba, the Vietnamese Party delegation also visited the Cuban Institute of Friendship with the Peoples, the University of Information Science and Technology, and economic-tourism facilities in Matanzas province.